Storica regata riservata alle classi Korsar e Dyas cresce di anno in anno offrendo uno spettacolo di colori. Una regata “turistica”, che coinvolge molti velisti europei, che abbinano allo sport velico una breve vacanza sul Garda Trentino. _________________________________________________________________________________________ Diese historische Regatta für die Klassen Korsar und Dyas wird jedes Jahr größer und beschert uns immer wieder ein buntes Spektakel. Als eine "touristische" Regatta, zieht es viele europäische Segler an, die zusammen mit einem kurzen Urlaub im Trentino Garda den Segelsport genießen. _________________________________________________________________________________________ This historic regatta for the Korsar and Dyas classes grows larger every year and always treats us to a colourful spectacle. 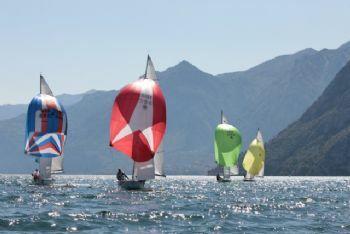 Considered a “tourist” regatta, it attracts many European sailors who come to enjoy the sport of sailing together with a short holiday on Trentino Garda.